Cooper Lighting Metalux™ Collection Standard LED luminaire in reflective white enamel finish, features code gauge prime cold-rolled steel construction. Ribbed frosted acrylic lens offers even light distribution. 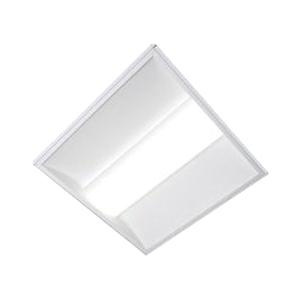 Luminaire in rectangular shape, employs 44.5-Watt LED lamp that has voltage rating of 120 - 277-Volts. Lamp has color rendering index of 85 and color temperature of 3500K to ensure optimal light level in the surrounding. Lamp offers 4934-Lumens of bright light output. Luminaire with 111 LPW efficacy, has average life of 60000 hours. It measures 48-Inch x 24-Inch x 3-1/4-Inch. Troffer uses 0 - 10-Volt continuous dimming driver for reliable operation. It withstands ambient temperature rating of 25 deg C. Troffer is UL/DLC listed and RoHS compliant.